Do you ever eat like eight bagillion of something and then you realize there’s only TWO left, which turns into, “What the heck…I’ve already ate this many, what’s two more!?”?! THESE. These do that to ya. 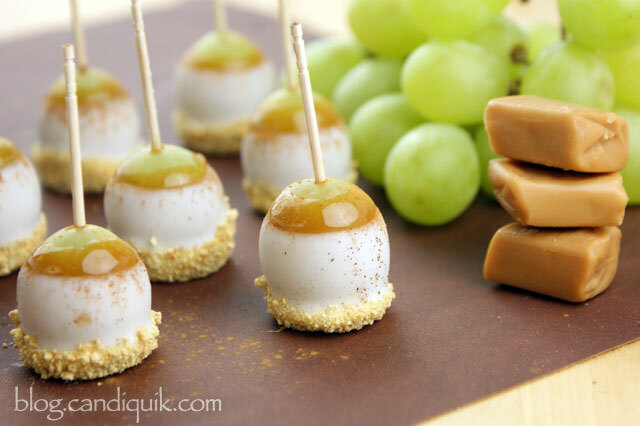 Caramel Apple Pie Grape Poppers. My life is complete. I’m usually fairly confident that I can resist the treats & desserts I’ve made. Because I can usually pawn them off onto coworkers, family, and friends. But these, no way. I’m hoarding these grape poppers and secretly hoping that no one finds them. They’re THAT good. My first version of grape poppers, no doubt, are amazing. But these take the original to a whole different level. These are like a caramel apple sent from heaven. Because what don’t you like about caramel apples? Is it that you have to cut them up to eat them without having caramel stringing from your teeth? Here’s your solution. 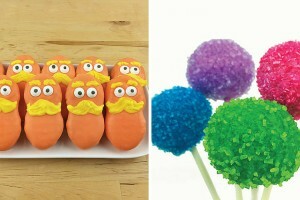 They are easier to make, they won’t stick everywhere, they aren’t awkward to eat…and they are totally POPPABLE. Which means you can eat like 15 of them because that equals about 1 caramel apple. Right? RIGHT!? 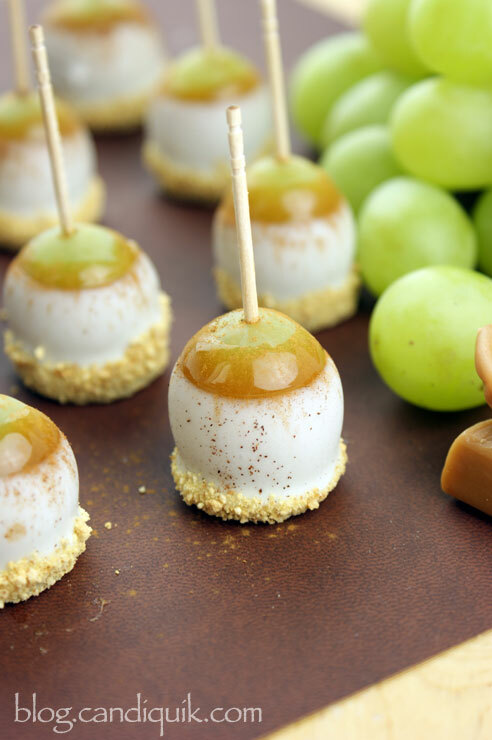 Plump green grapes dipped in creamy caramel, vanilla candiquik, then finished off with the subtle crunch of the graham cracker crumbs and a dusting of cinnamon. Also known as heaven on earth. 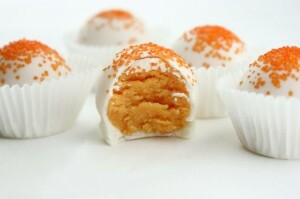 What people love about the grape poppers is that they are light, refreshing, not overly sweet and the perfect size. I hope you love these as much as I do! Melt caramels in a microwave safe bowl in 30 second increments until smooth. 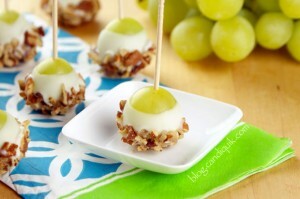 Holding the end of the toothpick, dip each grape in the melted caramel and place on prepared wax paper. Place grapes in the refrigerator for 15 minutes or until the caramel is completely set. Holding the end of the toothpick dip each grape in the CANDIQUIK; allow excess coating to drip off and return to wax paper. Dip the bottom of the grape popper in graham cracker crumbs and sprinkle immediately with cinnamon. *Keep refrigerated for best results. Goodness these are adorable. And I bet they’re equally tasty! I used the Werther’s baking caramels for the first time last month, and I really like them. Thank you! I loved those caramels, too! I hadn’t previously found them in the store, but I loved how they melted and they are delicious! Did you have a problem with them falling off the toothpicks while you were dipping them? Hi Casey, no not at all. If you notice from the photo, I inserted the toothpick in the top end of the grape (NOT where the stem comes out). Hope this helps! Thank you! should it be dipped in the graham crackers before the candiquick gets hard? or after? Theses look delicious. 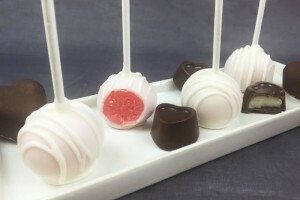 I really want to make them but am not sure what Vanilla Candiquik coating is? Can you explain? 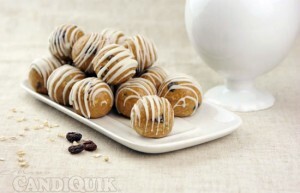 i would love to make these for appitizers on Thanksgiving here in a few days. Thanks so much. 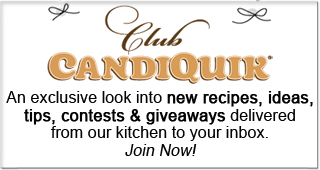 Candiquik is a candy coating, similar to an almond bark. You can find it at Target, Walmart and many other stores in the baking aisle. Thanks! Happy Thanksgiving! 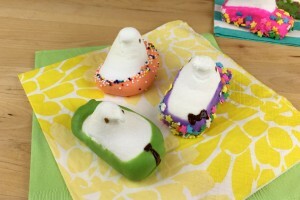 These are just insanely cute Sarah – and yummy too! Pinned! 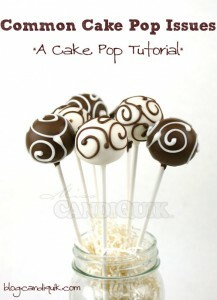 Can I make these a day ahead of serving? Hi Toni, sure can! But I wouldn’t go longer than that. Enjoy! I made these today for a party and while they are adorable, I found that they were very tedious to eat because microwaving the caramels made them “dry” a little crunchier than I expected. Still delicious but I was a little embarrassed at how chewy everyone said they were. I wish there was a way to keep the caramel really chewy because they are delicious otherwise. I haven’t tried the carmel baking chips but look forward to learning about them too. my caramel seemed stiff and does not look smooth like yours. went on pretty thick. Do you add water when melting the caramel? actually mine final finish looks amateurish. But they are yummy!